Adventures around Scotland blogger Susanne Arbuckle explores Fife's romantic side on a weekend away. I found myself exploring an enchanting Kingdom where a Prince met his now Princess before they married and went off to live happily ever after. It may sound like I had entered the pages of a fairytale but such a place actually exists and you too can live the Royal romantic dream on the idyllic east coast of Scotland. The Kingdom of Fife is where Prince Wills wooed the now Princess Kate while they attended university in St Andrews and the rest is of course history. Our fairytale weekend began as all good fairytales do in a secluded hideaway in the woods. However, this was no ordinary woodland retreat but a rather pretty snowdrop tent on Cambo Estate near St Andrews with it’s own double bed and just the right dose of rustic charm. This is true glamorous camping with cosy furnishings, cooking facilities and access to a modern toilet block with your own private shower, luxury indeed! In the evening the leafy pathways glow with fairy-lights and your own fire pit provides enough heat to keep warm while you sit and savor an evening under the stars. Cambo Estate is perfect for a romantic stroll with it's walled gardens, nature trails and pathway to the beach, all on your little canvas doorstep. A surprise box of welcome goodies and local produce from the lovely folk at Holiday Essentials ensured that we wouldn't go hungry during our stay; the handmade ceramic heart and love themed candle were thoughtful little romantic inclusions. They must be mind readers as our generous bounty included a bottle of one of my favourite Cairn o’Mohr wines and the yummy selection of sweet treats and savoury staples were ideal choices to keep our hunger pangs at bay. I don't know about you but I do love a night at the theatre and The Byre Theatre in St Andrews is one of my favourites in Scotland, it has such a nice ambiance and it became my second home when I was blogging for StAnza earlier this year. On this occasion we enjoyed a pre-theatre buffet dinner and a performance of Shirley Valentine in the perfectly proportioned auditorium. If you are ever visiting the town I highly recommend checking out their events list as the shows are great value and the atmosphere is intimate and relaxed. The following morning I met up with fellow Scotlanders for an early start at the recently opened Kingsbarns Distillery which is handily placed next door to Cambo Estate. After a quick catch up over some delicious fresh scones and coffee we were treated to a tour. Whisky is definitely an ingredient I would normally include in any romantic celebration, however my driving duties for the day meant that I sadly couldn't indulge on this occasion. Although I reluctantly had to turn down the offer of some free drams, the picture postcard setting were still great tasters which have left me with several reasons to return. Picture postcard is an overused term that I try to avoid but look it up in the dictionary and don't be surprised if an image of the Fife coast pops up! It really is the definition of scenic with colourful, quaint fishing villages, sparkling blue water, patchwork golden fields, magnificent sandy stretches and dramatic historic architecture. Undertake a coastal road-trip and you should expect it to take at least twice as long as planned with every twist and turn bringing new photogenic opportunities and the fresh salty tang in the breeze drawing you into the seaside communities in search of the catch of the day. With the sun shining and the day getting warmer, the expansive beaches were becoming more and more inviting. We were eventually lured to the blue flag sands of Ruby Bay in the East Neuk of Fife with our next stop at the nearby Elie Deli to collect our picnic lunch which was truly a feast fit for a King and Queen. What could be more romantic than enjoying fresh produce on a vantage point overlooking the coast and delving into a delicious spread of cheeses, meat, salads, olives and seafood before finishing off with the tastiest fresh local strawberries, meringues and cream, oh and a little bottle of Prosecco to wash it all down of course! This little independent family owned deli was packed with customers when I visited and with their choice of local suppliers, own baked goods and dedication to providing a great shopping experience, they deserve to be busy and supported. The whole region of Fife is steeped in fascinating history and for those interested in Scotland's past a visit to Dunfermline, the former Scottish capital, is a must. Previously a seat of royal power with connections to Kings, Queens, Saints; the birthplace of the famous philanthropist Andrew Carnegie, and the burial place of King Robert the Bruce, I get surprised at how often this historically rich and important town is overlooked on the tourist trail. What better way to learn about a place than a personal walking tour with a local who also happens to be a history expert. We had the pleasure of being taken through 900 years of Scotland's history by Jack Pryde of Discover Dunfermline Tours who led us on the trail of four Kings and a Saint which included visits to the birthplace of Andrew Carnegie, St Margaret's Cave and Dunfermline Cathedral. Jack was happy to to take his time to share his passion and knowledge of his home town and I left full of new facts and a much greater insight into how important this often passed by area was in Scottish history. Jack offers a range of tours in the area and is also currently involved with reviving the Medieval Pilgrim Trail which visited the shrine of the Sainted Queen Margaret, Scotland's only female Saint. Every romantic weekend should include a boat trip and Fife offers quite a few but a trip down the Firth of Forth under the iconic Forth Bridge, past sunbathing seals and interesting islands is pretty special. Our trip with Forth Boat Tours actually involved crossing over the water to the departure pier at South Queensferry and temporarily leaving Fife, but not for long as our destination of Inchcolm Island lies just a mile from the Fife coastline and falls within the regional boundary. With the best-preserved group of monastic buildings in Scotland in the shape of Inchcolm Abbey and some interesting wartime fortifications, there is plenty to see during your 90 minutes ashore. I've done a similar boat tour before although without the island landing and I highly recommend them as some of the best things to do in Scotland as they combine history, wildlife and an opportunity to see one of the country's most famous landmarks from a whole new perspective as you sail underneath. There is a law when visiting Fife that you must consume at least one fish supper, It's more like a local bylaw than an actual law, okay maybe an unwritten law, but it's definitely a law! Fish suppers are easy to find in the coastal villages and towns but those in the know make a special journey to Anstruther to join the inevitably long queue out the door of the award-winning Anstruther Fish bar. An institution in the area, be prepared for a wait but you won't be disappointed when your freshly cooked, light crispy battered, melt in the mouth fish is served up. There are plenty other local fish and chip options if you don't have time to queue, but wherever you end up there is nothing more romantic than enjoying your fish supper by the harbour, watching the bobbing boats as the seagulls hover in anticipation. In my opinion you should leave every trip, romantic or otherwise, with at least one memorable moment that makes you smile every time you think back. For me it was standing on the pier at St Andrews watching a swan teaching her young fluffy flock some grooming techniques, it was just the cutest moment ever and every time I look at this photograph I can't help but smile, hopefully it brings a little smile to your day too! 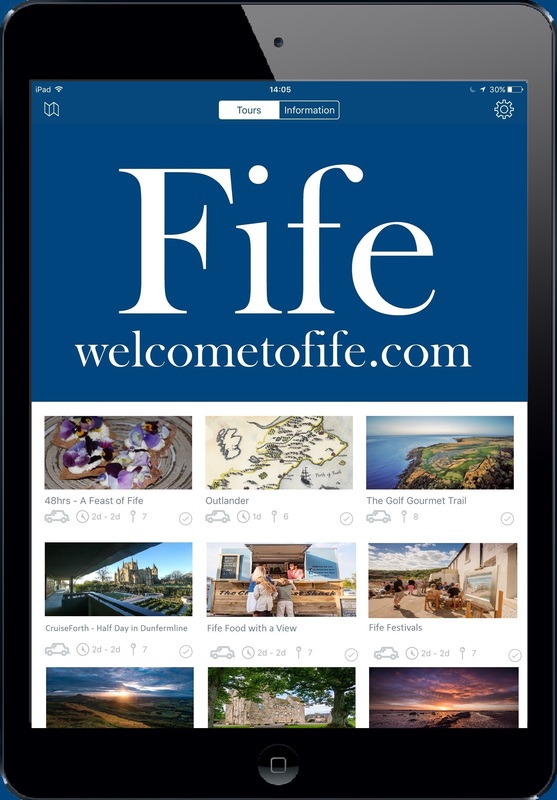 I travelled to Fife as part of a campaign with my fellow Scotlanders which was organised and hosted by Welcome to Fife, we all had a great weekend and even helped to get #LoveFife trending on Twitter!